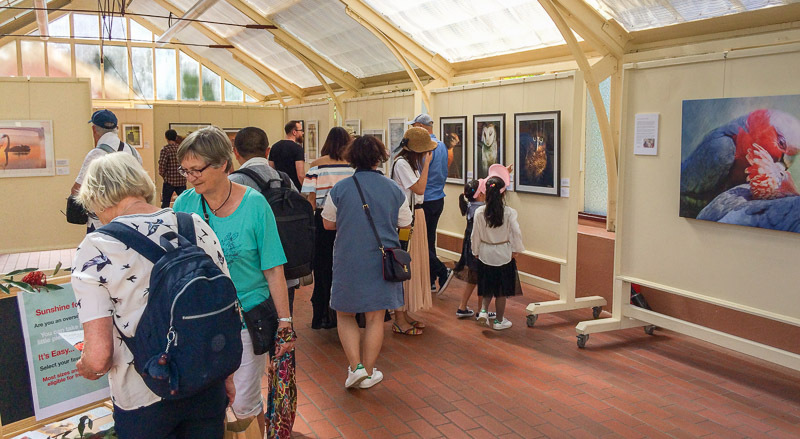 Hundreds of tourists, both domestic an international, went through the Palm House – that little jewel of a gallery tucked within the royal Botanic Gardens in Sydney. Their comments in my visitor’s book and on tape confirm how amazed and delighted they were by the wildlife portraits. The answer is “both” because the new trend, as I see it evolving, is a fusion where art is borrowing from photography and photography is borrowing from art. As to how I did them, the short answer is: painstakingly! Because the technique took me so much longer than I anticipated, I was caught a bit short-footed. I really had to rush to get everything organised in time for the November 1st opening. So many wonderful people pitched in at the last minute to help. I’m so deeply grateful for the overwhelming generosity of their time. It’s taught me the lesson to be more generous myself. We’re all so busy these days, aren’t we? Time is such a precious commodity to each and every one of us. Above all, I want to thank al those patient sitters, who calmly and generously posed for their portraits, sometimes for fleeting moments, sometimes for hours and days at a time. Some were divas, insisting on perfectly coifed feather-do’s, some were a bit rough and smelly around the edges. But each was the essence of nobility: warm, charming or handsome, each in their own wildlife-y way. Thank you also to all those noble humans, whether aboriginal, white or other, who take care of our wildlife at a hands-on level. If you missed the exhibition, you can still attend it “live” by watching this video as I lead you on a tour on the closing day. If you’re one of those people wanting to know more about wildlife fine art, stay tuned for more articles. Better yet, sign up to the newsletter. And have a wonderful new year!